This one-day practical seminar introduces the Functional Fitness MOT. It raises awareness of the importance of physical activity and physical function for older people and demonstrates how the FFMOT can help professionals frame their discussion. The Functional Fitness MOT is a person-centred tool that uses a number of different physical function tests to give older adults an idea of how their fitness compares to their peers. The results of these tests can be used to discuss the different components of fitness and highlight individuals’ strengths and weaknesses. The Functional Fitness MOT can be used as an educational tool in a variety of settings including leisure centres, shopping precincts, community centres as well as residential settings. It includes activities such as chair sit and reach, 30 second chair stand and handgrip strength. This one day practical course is designed for anyone working with older adults to increase physical activity levels, strength, balance and co-ordination. This includes physical activity practitioners, active ageing development officers, sports development professionals, occupational therapists, therapy assistants, older people health care services, exercise instructors and physiotherapists. Describe the main features of the Functional Fitness MOT and how it works in practice. Describe the key elements of the UK physical activity guidelines for older adults. 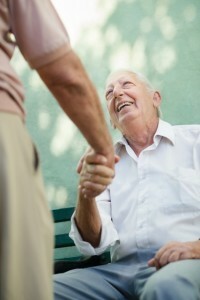 Start a meaningful conversation about being active and functional fitness with an older person. Identify how the Functional Fitness MOT can be implemented within their setting. Know how to access additional resources to support the programme. The FF MOT was first designed by Dawn Skelton and Bob Laventure for the Glasgow Science Festival in 2011, to provide a science learning event for the older people that were bringing along their grandchildren to the festival. Over 60 older adults took part in two events, one at Glasgow Caledonian University and one in Govan Shopping Centre. The FFMOT was then run throughout the World Congress on Active Ageing at the SECC, Glasgow and over 300 older people took part throughout this week event. The FF MOT has been run by Glasgow Caledonian University with a local charity called ROAR-Connections for Life and you can watch a brief video here. Bob then designed a training day, based on the training that had been offered to Glasgow Caledonian Students and Staff for the previous events, and the FFMOT training day was offered for 4 years through the British Heart Foundation National Centre for Physical Activity and Health (BHF NC). Whilst the training was hosted at the BHF NC there were over 30 training days reaching over 600 professionals and 5 Physiotherapy Specific training days reaching over 125 physiotherapists (AGILE). A summary of much of that work was published by The BHF NC in 2014 and a link will be provided here shortly. From Feb 2017, Later Life Training have taken on the FF MOT training and will maintain the same pricing structure and high quality training as was previously provided by the BHF NC. Functional Fitness MOT training programme. 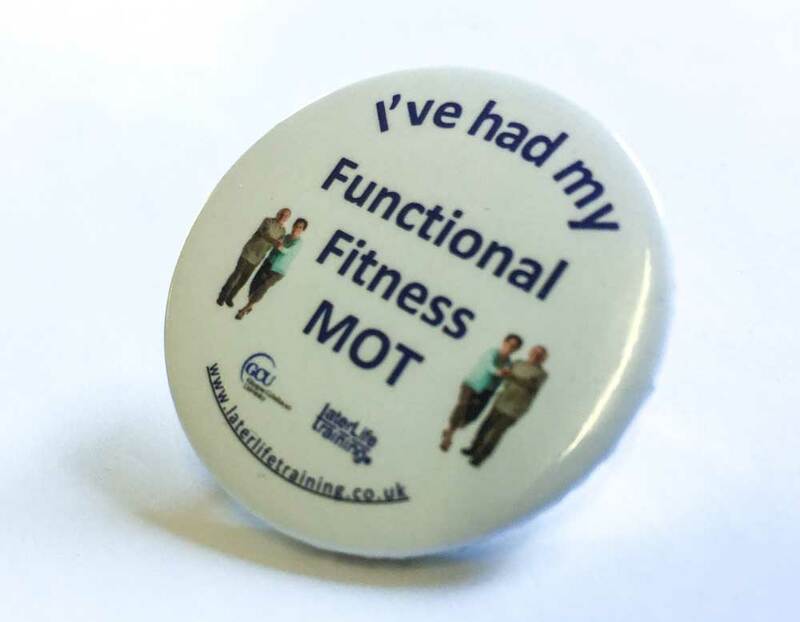 You can also order “I’ve had my FF MOT” button badges from the LLT shop which can be used as incentives for participants. There is no formal assessment on the FF MOT training day, but participants are given the opportunity for personal and professional reflection on their current practice and identify how the course content can enhance their future work as individuals or as a member of a team or service through an individual action plan. The FF MOT has received a lot of anecdotal evidence on the positive outcomes to participants and also to the professionals attending training and delivering the FF MOT in practice. Many of these are highlighted in the BHFNC MOT impact assessment. We have also published an abstract in Journal of Aging and Physical Activity (2016). As yet there has been no scientifically evaluated outcomes of the FF MOT. However, recently in Edinburgh, a feasibility study on the implementation of the FF MOT within musculoskeletal physiotherapy outpatients clinics was undertaken. You can read the protocol for this study here. The results are positive, there was good uptake to come to the FF MOT run at the clinic and feedback was positive from both the participants and the therapists. They did, however, feel that the FF MOTs could be a good place for physiotherapists to refer to out in the community and did not need to be run within the clinic setting. You can read the full paper here. A poster on the results is also available here. The content of the FF MOT training and the resources provided is based upon the following evidence. Glasgow Caledonian University and Later Life Training are both renowned training providers and your certificate will have their logos on. 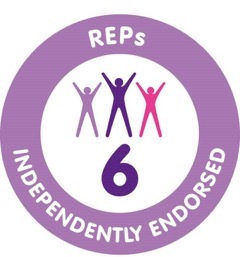 The Functional Fitness MOT has been endorsed by PD:Approval (now managing all endorsements previously of Skills Active) as being worth 6 CPD points for members of the Register of Exercise Professionals. This training has been endorsed by CIMSPA and receives 6 Developmental CPD points. The cost to host a course for up to 24 candidates is £1,200 + VAT. It can be run for a maximum of 24 participants but will require at least 12. The cost of venue hire, refreshments and local promotion are to be covered by the hosting organisation. The host organisation will also be required to print off 2 course manuals/resources (1 set per participant roughly 50 pages in total) and make these available on the training day. The cost for an individual wishing to join an existing advertised course is £70 + VAT. There is a discounted cost for an individual working for an NGO or in the 3rd sector of £60 + VAT. This price includes a full day (6½ hour) tutor-led session, with some practical elements, as well as resources for all participants to take away. If you want to host a course in your area, please contact the LLT Office. If you are an individual wanting to attend a course but there are no course dates offered in the course dates listings, please also contact the LLT office. We encourage everyone to be responsible for their own learning. In light of this, we ask that you please inform us, at point of application, about any learning support requirements and/or medical conditions support that will help you to access our course content and learn effectively. All information will be treated confidentially and we will make reasonable adjustments to meet your needs. You can purchase FFMOT badges for your participants.